Inspired by the sun - the slim, straight-forward garden furniture collection O-ZON by Royal Botania fits perfectly in modern and classic living environment. The O-ZON dining table is part of the extensive garden furniture series, which also includes stackable bar chairs, chairs, armchairs, sun lounger, side tables, larger dining tables and bar height bistro tables in various sizes and designs belong. 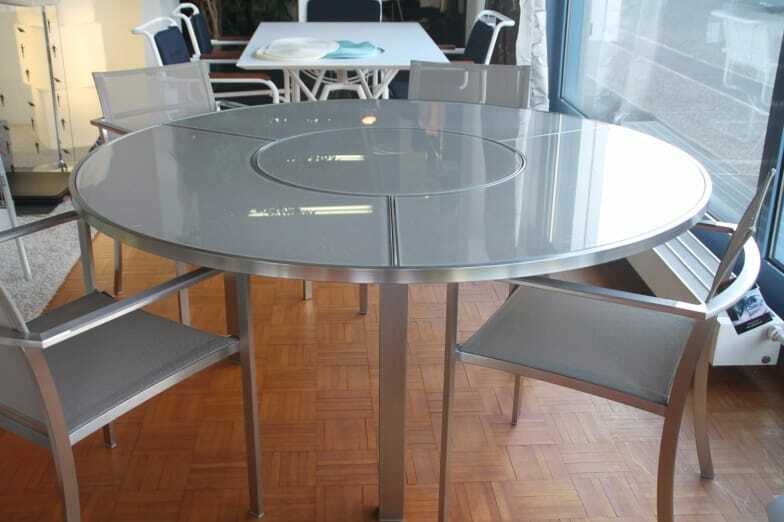 The O-ZON dining table can be ordered in different sizes, with or without integrated turntable (Lazy Susan). The turntable can be ordered in colour to match the top or in stainless steel. In addition to the glass and ceramic surfaces the O-ZON dining table is also available with teak top. Stainless steel is a ferrous alloy with increased corrosion resistance due to the addition of chrome and nickel. In order to obtain a chrome-oxide and nickel-oxide surface that is of a high grade purity and homogeneity, thus achieving optimal corrosion resistance, the Royal Botania frames are etched and subjected to a passivating process as a standard treatment. We recommend the optional electropolishing treatment of the frame if it is to be used in a corrosive enviroment such as in pool or beach areas. The coloured lacquered table tops are made of glass or ceramic. Over the years the Royal Botania name has become synonymous for the most technically refined, and most divers, outdoor collection on this planet. Indeed not only do we cover a very wide span of different materials and styles, but every single piece is designed and engineered so as to offer a perfect blend of precision and functionality. Our goal is to fulfill, each and every wish, of our privileged customers. Do you have a question about "O-ZON (Lazy Susan)"? How can we contact you?